After sharing some photos of my broccoli harvest on Facebook, I received the following request. 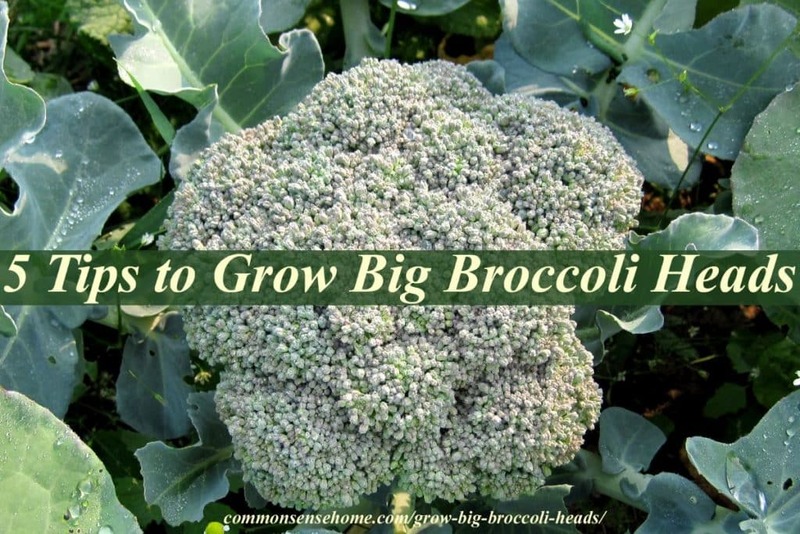 “An article with tips to get big broccoli would be most appreciated! I have big beautiful plants and itty bitty broccoli.” After growing broccoli for many years, I've probably made every broccoli growing mistake in the book, so I may now qualify for Broccoli Growing Expert Status. 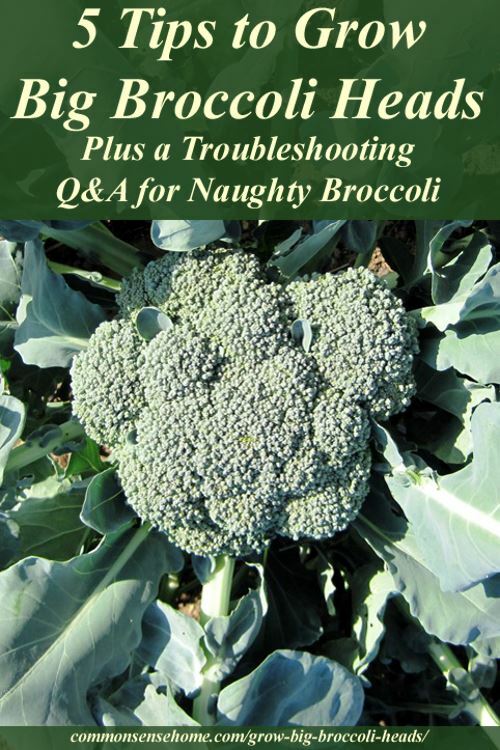 😉 We'll start off with some broccoli growing basics, share some tips to get nice, big broccoli heads, and finally wrap up with troubleshooting tips for misbehaving broccoli. Broccoli likes cool weather, but not really cold weather (we'll get to that in a bit). As noted on my printable seed starting calendar, seedlings should be started inside 4-6 weeks before the last spring frost. Broccoli growers in hot weather climates may have better luck with a fall crop sown inside between mid August to mid September. Transplant when seedlings are about 3 inches (7.5 cm) tall, roughly one inch (2.5 cm) deeper than they grew in the pots. 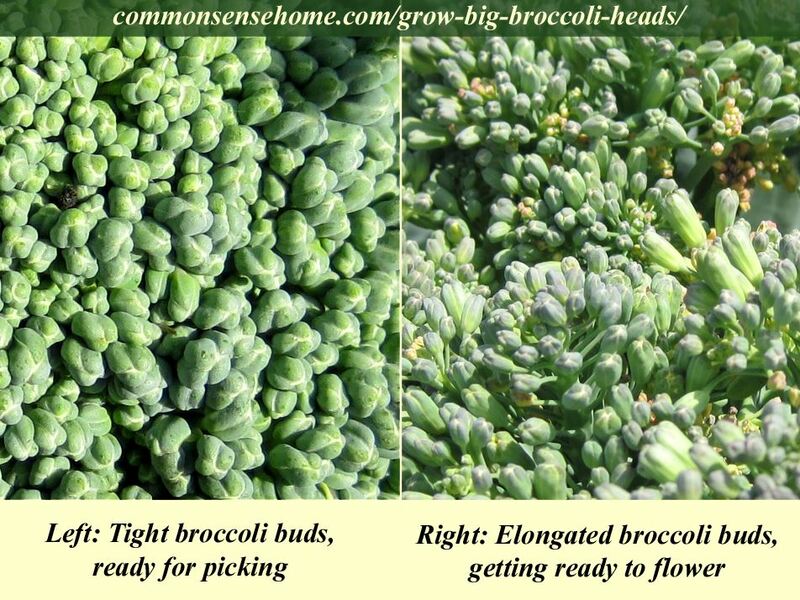 If you're buying seedlings from a nursery, you will likely get something labels “broccoli” that will hopefully be a good variety for your area. If you're making your own selections from a seed catalog, note Days to Maturity and growing habits. Most listings will state whether the variety is known for producing a large head, abundant sprouts or both. My favorite variety to date for here in the upper Midwest is Nutribud, which features a large center head and abundant side sprouts. Most years, I can keep picking from midsummer to frost off of one planting, although often as the season goes on I start allowing some plants to flower, because they are one of the few flowers available for the bees after hard frost. Broccoli Requires Rich Soil! I think it may be impossible to overfeed broccoli, especially when it comes to nitrogen. Space Plants Roughly 18 inches (40 cm) Apart – I prefer to plant in wide rows with a staggered pattern – 2 plants, 1 plant, 2 plants, 1 plant, and so on, and then leave a 12 inch (30 cm) space between the wide rows. In the photo below I have part of my broccoli, cauliflower and cabbage bed. The black “X”s mark the grid of the cauliflower plants. The broccoli is to the left at the edge of the photo. 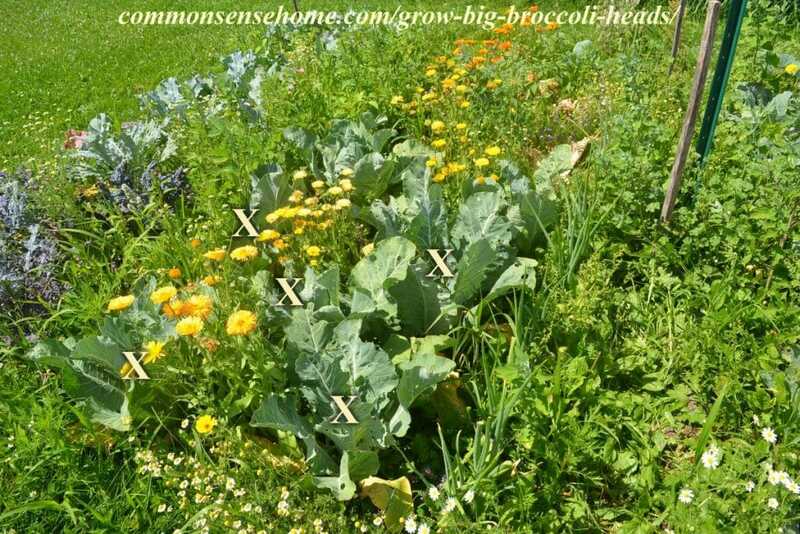 In between the broccoli and cauliflower I pop in companion plants like calendula and alyssum. Along the edge of the cauliflower there is also a row of onions. It's a little weedy and wild here, but still productive. Full sun is preferred for best yield, although the plants will tolerate partial shade, especially in warmer climates. *Note: Strong scented herbs such as dill may deter cabbage butterflies, reducing the incidence of green cabbage worms on your broccoli. Work plenty of rotten manure, some blood meal or cottonseed meal into the soil before planting, and consider watering with fish emulsion or other organic fertilizers every three to four weeks during the growing season. Rainwater is best, but if rains fail, your broccoli needs 1 to 1.5 inches of water each week. In my garden this year we are roughly 5 inches short on rain for the season. Although I have watered some, I can tell the difference in the smaller broccoli head size. 2-3 inches of organic mulch such as grass clippings, finely ground leaves or straw helps to keep the soil from overheating, which is important because heat will cause broccoli to bolt (send up flower stalks). *Note that in cool areas with a lot of moisture, the opposite treatment may be needed. Excessive moisture can lead to booming slug populations. When we are waterlogged, I skip the mulch and spread the area under the plants with crushed eggshells to keep the slugs in check. In very cool areas, black plastic or black landscape fabric under the plants may be helpful to bring the soil up to temp. Cole crops such as broccoli, cabbage, cauliflower, kale and kohlrabi benefit from significant amounts of boron. If your soil is very acid or alkaline, boron is less bio-available plants. The first signs of boron deficiency in plants shows in the new growth. Leaves will yellow and growing tips will wither. If you suspect a boron deficiency problem with your plants, a dose of boric acid (1/4 cup to 2 gallons of water) used as a foliar spray will do the job. Be careful as you use boron on plants. Again, heavy boron soil concentrations are toxic. Boric acid is another name for the common household cleaner Borax, which you may be able to find in the laundry aisle. As I mentioned above, broccoli can be found with different types of growth habits. You need to find the right variety for your area are production preferences. I've stopped attempting to grow Romanesco types, because they require a very long season of mid-range temperatures. I tried growing them for three years, and only one year out of the three did I get decent sized heads. The plants are also ginourmous. I'd rather grow a monster head of cabbage than a huge mass of leaves with a modest head of broccoli in roughly the same space. I also avoid broccoli raab, because we have a high sulfur content in our soil and even normally “mild” cole family crops tend to be quite pungent. Given that raab is already known for its strong flavor, I suspect it'd be nearly inedible grown here. If your small broccoli plant is already making a head of broccoli, you're not likely to ever get a large head of broccoli from that plant. Consider it a learning year and try again. Your broccoli may have gone blind. Seriously – as strange as it sounds, broccoli blindness is a real thing. If the growing tip of the broccoli is injured via rough handling, insects or weather, a head may not form. Alas, the broccoli head ship has sailed. Once you see flowers, your broccoli head, even if it was very tiny, is already going to seed. You can still eat the broccoli once it is starting to flower, but the flavor and texture of the broccoli are better when the buds are nice and tight. A head of broccoli is just a big old cluster of tightly packed flower buds, and that broccoli plant wants to flower and produce seeds if you give it a chance. Hot weather is likely the cause of your broccoli flowers. Once it gets above 80 F (26.7C), plants can bolt very quickly. Pick all heads and side shoots promptly, even if they are small. Remember earlier where I mentioned boron? Hollow stalks mean your soil is lacking in boron. It's too late for the rotting plants, but if you have some broccoli plants that haven't been harvested, you can treat them and it may help prevent more rotten broccoli stems. You have been visited by the infamous cabbage butterfly, whose larva are now devouring your broccoli. As I mentioned in the companion plant section, strong scented herbs may help keep them at bay, but they are not 100% full-proof. The only sure way to keep cabbage worms off your plants is to isolate the plants under a floating row cover or mesh cages that surround the broccoli plants. We have too much wind for row covers, and my planting area is never the same size twice, so I haven't used these methods, but a friend of mine with a crafty husband has some beautiful custom built broccoli cages covered in window screening. Cages would also work great if you had uniform sized raised beds. My tactic to minimize cabbage worm damage is to simply fertilize the beejeezus out of the plants and give them lots of TLC so they grow vigorously enough that the worms don't bother them much. There are cabbage butterflies all around, and the larva do nibble some, but I've only had severe infestations in years where the plants were exceptionally stressed due to drought or poor soil conditions, like the year we first broke ground here at our current home. Some beneficial insects such as wasps will eat the cabbage worms. We also place sticks for bird perches and a bird bath around our cole plants, and have noticed the birds hunting down around the broccoli, cauliflower and cabbage. Once you've harvested your broccoli, you can use this simple method my mom showed me to remove the worms before serving or preserving, if desired. Read, “The Easiest Way to Get Worms Out of Broccoli“. The worms are edible, but I'm not that hungry. I hope this post helps you grow the best broccoli to ever grace your garden. If you have comments or other gardening questions, please share them below and I'll do my best to answer here or in a future post. Thanks so much for visiting! Shares and Pins are always appreciated. Thank you once again for an article that just makes good sense. Thanks for this item has given me great in formation. Laurie, With low-level understanding of Pintrest, am never quite sure what is being presented. An avid sourdough baker and bread history follower, I was struck by the photo of French breads on your site. Wondered if this would be simply photographs of breads–a new kind of enthusiasm. Found your recipes, sourdough efforts but my eye caught your “Old-Fashioned Rhubarb Cake.” Two cups of rhubard–always looking for those that use generous amounts of a favorite fruit/vegetable. Going to try soon! Thanks so much. If you have not seen the FB page, Sourdough Bakers– and another, Bread History and Practice–check them out. Thank you for this post! My sister needed some more information on broccoli, that could help her harvest more and I’m surely recommending your post to her. She’ll be very glad to have all these facts and advises on mind. Thanks for sharing! My broccoli is beautiful…all leaves, no head. I think I have been over watering right along. I hose it down almost every evening. Do you think that’s the case, or are they blind from damage? It’s nearly impossible to tell what’s going on long distance. I would reduce frequency of watering, and add a tablespoon of Borax per gallon of water to boost the boron levels. Thanks for your post on broccoli! I planted broccoli (in containers) for the first time this year, and they are just starting to form heads. (I live in a warm climate, so I tried fall planting.) Do you know how long it typically takes from the first appearance of the head until they may be ready for harvest? I have not been able to find this info online, only the total average time from planting to harvest. I have no idea what variety they are–just Bonnie plants from the local home improvement store’s garden center. It really depends on conditions and can vary widely – thus no set length for head development. Watch the growth. When it stalls out, you’re probably as big as you’re going to get. If the buds start “stretching” and are no longer in a compact head, pick ASAP, because they’re heading for flower stage, big head or not. I live in sub tropical Australia and have great success with broccoli during our mild winter months. I use neem seed oil solution as a spray and soil soak for control of cabbage moths and grubs. Its organic and easy to use. One soil application when the plants are small and two light sprays at most seems to keep chewing bugs under control without harming all the beneficial bugs. And a little goes a long way. Is there 1 or 2 types of broccoli that are better for containers than others? Can I start them inside my apt? Look for quick maturing varieties such as Atlantic, De Cicco, or Waltham #29. These will produce smaller heads more suitable for containers. You should be able to start them inside, just make sure they get plenty of light, and touch the seedlings regularly to toughen the stems and make them sturdy. We have tried and failed a few times to grow big-headed broccoli, and are eager to apply your tips. Our fall back has been kailaan , a Chinese sprouting broccoli (never noticed a pungent taste from it), which my Mom recommended, though she spells it gai lan. Our weather flips between wet and dry all summer, and there will inevitably be Fog Week in late summer when when powdery mildew sets in. If we grow companion plants between cole plantings, would it be necessary to cut the plant buddies back to increase air circulation? Are there companions that help control mildew? Maybe thyme? I have been successful dusting the leaves of squash with Borax powder to control mildew. We’ll try it in our cole crop soil and love the idea of a new multipurpose protector in the garden. We see pollinator wasps in and around our garden, usually in fall. I am going to encourage some umbelliferae to flower, but I notice in the last two years that my cilantro seeds aren’t germinating. Is this one better to start indoors? I don’t know specifically about plants that help with powdery mildew. Improved air circulation is usually the first thing suggested, but sometimes the weather simply doesn’t cooperate. Another option is working to boost the beneficial microorganisms so they fill the ecological niches that would normally be taken by the problematic microbes (mildew). You might consider EM-1 microbial inoculant, and/or bokashi cultures. I usually direct seed cilantro, although some years it can be a little reluctant to germinate, especially if the soil is dry. Soaking for a few hours before planting may help. Thanks! I think EM1 is a fermented product from one of the Korean Farm technique recipes. From what I recall it uses common kitchen ingredients and a quiet, warm spot to ferment for a week or two. It turns into a super juiced up raw vinegar tea. We cultured Bokashi when we lived on Maui. It did best at about 75F and was very nutritive, dynamite on papayas during a period when a fungus was decimating them statewide. I’ll check on whether we have a long enough warm season to culture a batch. Finding a way to mildew proof our garden would be fantastic! Regarding coriander, all this time I thought it might have been too cold for them, even thought I planted several times in spring and summer! Will try soaking, and possibly starting some indoors. I have a terrible habit of forgetting that I left seeds to soak… so I rarely try soaking anymore. The seeds pop up just fine. By any chance were you using open pollinated seed/plants? If so, there can be significant variation in the plants, even if they are supposed to be the same variety. Alternatively, is there any difference in the soil between the two spots, or the amount of moisture? Those would be the most common causes of differences. Hi there! My first attempt at broccoli. I sprouted indoors, transplanted to outdoor raised bed. They haven’t died, they haven’t grown. They are just stuck at the same size. They have not sprouted any new leaves. It’s been over a month. It’s like they have gone dormant. Color is good. Do you have any idea what I am doing wrong? It’s hard to say without knowing more about your growing conditions. Is it too warm? Is it too cold (unlikely, as they can tolerate temps near freezing). How’s your soil? Are they getting enough water – but not too much? The most likely scenario is that they are root bound, i.e., they were left in their little pots too long before planting out. The roots continue to stay crowded close to the plant and the plant fails to thrive. If you have multiple plants, you could try gently digging one up and examining the roots. If they are small and tight, you can try loosening them up and replanting, but at this point, the odds are not so good. Still, if the plants are doing poorly, you have nothing to lose. Hi Laurie! Thanks for your response. We have had approx 3 weeks of triple digit weather here. Shortly after I transplanted them into the raised bed, we finally put up some burlap to give all the plants some shade. The tomatoes thrived, as did everything else, but the poor little Brocs and the Brussel Sprouts are in that dormant stage. The soil is moist, and we have it on auto water during now, the hottest part of the summer. Now, I did try the toilet paper roll as a seeding pot. I wonder if that is too much for the tender roots… When I planted them, their little roots were coming out of the bottom so I assumed that they could work through that and into the soil. I will go out and remove that tp roll from them and put them back in the dirt to see what happens. Sadly, it may be too late to plant some new ones. I was hoping for a fall crop of broc and Brussel sprouts for Thanksgiving! I will let you know. And I did thin them out when I transplanted them. hmmm…broccoli don’t like heat, so I’m sure that didn’t help, and I know so many folks claim you can plant right in toilet paper tubes or peat pots, but I’ve never gotten good results by doing so. I often find fall crops a little tricky. Most like cool weather, so getting them started in the summer heat can be a challenge. Oh! Well, that could explain alot! LOLOL… They don’t like heat! Well, I am not sure about planting any more. Perhaps next spring? Just makes me sad. Oh well. I will try again next year. I guess it couldn’t hurt to just let them ride and see what happens? I don’t have anything to replace them with anyway. Again, thanks for you your help. The Farmer’s Almanac said it was okay to plant them but I guess they didn’t realize we wer in the High Desert in Southern California! Warmest Regards! Thank you for the very good info on Broccoli. To deter the typical cole crop pests , I am going to try ” Surround ” It is a very light clay product I have used for other crops including Tomatoes , Peaches ,and Apples. I will try it on a couple of plants. Hopefully it will keep plant temp down and make the Broccoli unappetizing to Cabbage worms , slugs and other pests. I have no commercial stake in ” Surround” It has worked for me and it is really not very well know. My only concern with using it on Broccoli is , with the tight florets , will it wash off. It is not poisonous and is used for organic purposes Hope this helps. Your broccoli may end up a little gritty, but since it’s kaolin clay based, it should be harmless to eat. Bentonite clay is commonly used in natural health circles, externally and internally. 1st time growing broccoli indoors, type I’m using is McKenzie broccoli munchkin. Tried seeding it in peat pods, the stem came out spindly. Decided on trying it again with natural fibre pots & promix organic seed starting, getting the same results. Watering every couple of days with distilled water. My radishes & green peppers look healthy. Thinking it maybe the type of broccoli not suited for indoors, do you recommend or have an idea what may be the problem. How much light do they get? Do you have a fan on them at all to force them to toughen up against the resistance of the breeze? What are the temps like? Broccoli prefers cooler weather. You might want to add some sort of foliar fertilizer to your water, such as liquid kelp. With our overly hot summer my broc was blinded by heat. Living in Minnesota, I’d like to give fall planting a shot. It is still super hot here but frost risks are high by October. Will there be enough time if I plant in 2 weeks?? I live in Alabama and we have almost no winter. Our broccoli plants grow good leaves but will grow one broccoli that gets about a foot tall and then flowers. We have never been able to get them to make a head. We have tried planting this about three times over the years and it does the same thing. Any suggestions? The most obvious suspect is the heat. Warm weather triggers bolting (flowering). Have you tried shifting when you plant them? Is there a local gardening friend who grows it successfully that you could hit up for tips? Each area of the country is a little different, so different varieties are likely to be a better fit for your area than mine, and our best time for planting is different. Best broccoli counsel I’ve found so far. Still searching for more varieties for where I live in warm/hot west Africa. I’ve tried 2 years to grow broccoli. 1st year failure–beautiful plants but no heads–needed more fertilizing and more sun. This year limited success, but as you note–you have to diligently watch your timing, sunshine, and fertilizing. Will watch out for the boron issues. We’re blessed to have no cabbage butterflies–at least they didn’t find my patch this year! And I think it also helped to have 2 patches. Biggest problem this year was aphids, but learned best thing to do is spray them off. I tried the neem oil, but that damaged the plants when they were exposed to sun the day after.